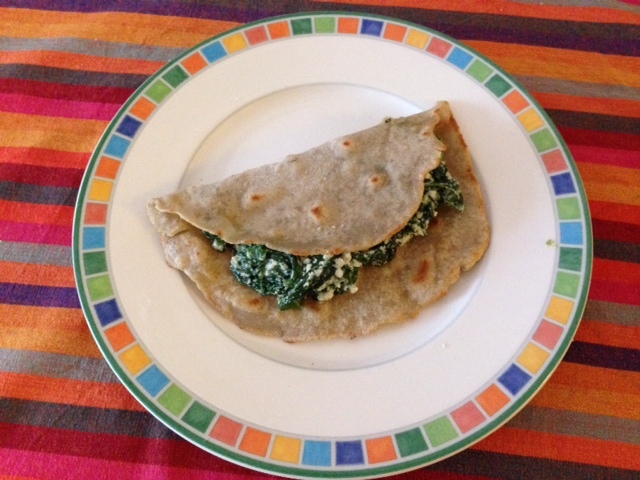 I’ve really been enjoying making flat bread from buckwheat flour. It is a great alternative to white flour and yeasted bread. To make the dough it only takes two minutes and it is very easy to work with. I’ve been using it as a wrap or a crepe, stuffed it with whatever the season provides. These wraps are a great addition to the lunch box menu and, in fact, my three year old loves them for their playfulness. She rolls them into easy to pack and eat rolls and I never find any leftovers. I usually fry the bread in ghee or coconut oil, which are the only fats that do not turn bad when heated. Sometimes I don’t use fat at all and bake them dry. This recipe is just one of the variations and is my great favourite. I love pasta with spinach and ricotta cheese. Here is a friendlier version for the slow spring digestion. Although ricotta cheese is not the best option for this season I find it necessary as it smoothens down the pungency of spinach. Also a little chilli makes dairy much easier to digest. I might also add a bit of parmesan cheese to the mix. Work the dough into flat circles depending on the size of your baking pan. Add ghee or coconut oil in the pan and fry on both sides until golden brown. In another pan fry the garlic and chilli lightly in ghee and add the spinach. Cook until soft and then add the ricotta cheese. Savour with salt, pepper and parmesan cheese. Enjoy together with the flat bread.